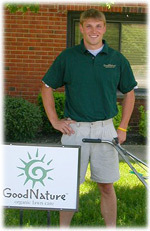 I started Good Nature Organic Lawn Care in 1999 with an old Subaru hatchback, a few willing clients and a dream. A dream to provide a safer way to care for our lawns. Today our company is proud to serve thousands of great clients who enjoy healthier, heartier, more robust lawns that are resistant to weeds and extremely friendly to children, pets, and our environment – all because of our organic lawn care services throughout Ohio! Back in high school, my biology teacher taught us about the problems lawn fertilizers and chemical uses in a nearby suburb were having on a local trout stream. Later that year, my dad asked me to spread a popular weed & feed on our lawn. But, when I read the back of the bag I told him that I wouldn't do it. After a while, my dad gave in, but told me, "I'll take the fertilizer back to the store, but you need to find another way to keep the lawn looking nice." Bummer. I thought I was getting out of a job, but now I got a bigger job! I did research into organic lawn care and began treating my parent's lawn organically. Then, after graduating from college with a degree in engineering, I decided to see if the rest of Cleveland would be interested in treating their lawns organically...just like I treated my parent's lawn. And, Good Nature Organic Lawn Care was born. That was 1999, and today thousands of our neighbors are experiencing the peace of mind that comes from treating their lawns with all natural products rather than with harmful chemicals. I hope you'll consider joining us!